Inuyama is an ancient castle town located in the northwestern part of Aichi Prefecture. It is a part of the Hida-Kiso Guasi-national park.The town is noted for historical spots and its natural beauty. 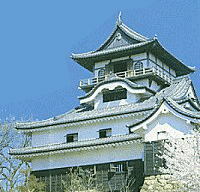 Inuyama Castle, the center of the town, was built by a warrior general, Nobuyasu Oda, in 1537. The history of the town, however, goes back to the "Kofun" period, the ancient period when people built many gigantic mound-like tombs. Inuyama has grown as a tourisut town because of its historical sites, old temples and shrines, and other tourist attractions. In 1987, it was designated as an International Tourism Area. Nihon Rhine Summer Festival is held on august 10th annually with many events including fireworks at Kiso rivar and ships of sheaved straw. Hime-no Miya Shrine Grand Festival is held on sunday before March 15 at Oh-agata shrine and is well-known abroad as rare festival for the god of the cosmic dual forces. Ishiage Festival is a summer festival for Sengen Shrine and is held on the first Sunday in August. It is well-kuown as one or three majo rare restivals in Owari. express train to about 1 hour. Inuyama is known as a source of many local dishes that offer a true taste of the seasons. These include various sweetfish dishes and one-pot duck dishes as well as "Dengaku" - skewered and browned slices of tofu covered with plenty of miso. The flavor and savory aroma of these dishes are known to stimulate the appetite. as well, the dishes that incorporate fully grown sweetfish(Ayu) from the Kiso River are remakeably tasty. Two popular dishes of sweetfish are "Ayu -no- shioyaki", sweetfish grilled simply with salt to allow their natural taste to come through, and "Ayu-no-kanroni", sweetfish simmered in a sweet and salty sauce. Time-honored Japanese good-luck charms - made of paper, cloth or wood - are believed to ward off accidents in everyday life. The many different kinds of amulets are claimed to protect their owners from traffic accidents, health problems, difficult childbirth and otherperils. The amulets can be purchased at temples and shrines. Each is kept in a small fine lame pouch, and can be attached to a purse, much like a key ring. Remember not to open your pouch, or your prayers will not be answered. These beautiful amulets make great gifts for your friends. Imuyama Pottery dates back about 300 years, when the village of lmai constructed a kiln and began producing pottery. The works bear painted images of cherry blossoms and maple leaves, which create a simple yet impressive appearance. The pottey studios in the city offer visitors an opportunity to try their hand at decorating Inuyama ware and experience a 300-year-old tradition. (Reservations required.) "Ninto-shu" is a medicinal liquor made of plant stalks, buds and distilled spirits. This alcoholic beverage, made at a 400-year old brewery, has a rich aroma and a flavor reminiscent of sweetend whisky. It is said to help dispel fatigue. Cormorant fishing, the practice of catching fish with tame cormorants, has been practiced for some 340 years. Against the backdrop of Inuyama Castle towering into the night sky, one can see a number of fishing boats, flaming torches suspended from their prows to light the surface of the river. This scene creates a truly magical atmosphere. You can also enjoy a dinner on a Japanese-style houseboat, watching the fishermen - known as "Usho" - commanding the birds with ropes. →go to cormorant fishing page Interaction between Europe and Japan led to the development of "Karakuri", or mechanical dolls, during the Edo period. The dolls, which incorporate mechanisms developed for the Japanese clocks of that time, run on gears, power springs and other devices. "Karakuri" can be roughly divided into two types : festival float "Karakuri" and household "Karakuri". Aichi and Gifu preserve only festival float "Karakuri". In April, 13 floats are paraded around the city as part of the annual Inuyama Festival. The city's back street still show evidence of stately old samurai residences, their gates and walls lining the streets. Turning down the town's alleys, one feels immersed in the Edo era. Strolling through the city, one imagines the spirits of the samurai coming alive. Several old privatehouses have recently been converted into restaurants and galleries. This blending of the old and new elements make for a truly appealing streetscape. "Momotaro" is one of Japan's most famous folk tales. It tells the story of a boy named Momotaro, because he was born from a "momo", or peach. Once grown, he goes on a quest to smite the ogres, known as "oni", that cause people nothing but trouble. Many places across Japabn are said to have been associated with the legend of Momotaro, but Momotaro Shrine is known as his birthplace. The precincts of the ahrine feature a variety of that accompanied him on his adventures - a dog, a monkey and a pheasant. We invite you to visit and enjoy this introduction to a true Japanese folk hero. Experience "Wabi" and "Sabi" - Refined Rusticity and Elegant Simplicity - at "Jo-an"
This is Japan's oldest castle tower, constructed about 460 years ago. Jo-an Tea House, a national treasure, is located in this beautiful Japanese garden. It was constructed in the original Japanese architectural style. The museum exhibits the festival floats used in the Inuyama Festival as well as numerous other valuable cultural properties. The festival boasts a 360-year history. Recreating houses of the former castle town, this hall displays four decorated festival floats that the Aichi Prefrcuyural Government has designated as tangible folk cultural properties. The temple was constructed in 1928. Every year on August 17, a ceremonial offering of floating lanterns is held on the Kiso River to see off ancestral spirits. This ceremony adds beautiful colors to the summer night. The wooden main hall is painted in eye-catching vermiliom.The temple precincts offer a panoramamic view of the city. The temple is famous for honoring the god of traffic safety. This multipurpose center serves to link tourist attractions in Inuyama with opportunities for international exchange. It also features a swimming pool and a training gym. The shrine lies along the Kiso River, said to be Japan's most beautiful river. People worship Momotaro as the god of children. This museum attractively displays a collection of more than 40,000 folklore artifacts. It features outdoor exhibits of reconstructed and restored traditional residences from around the world. Shooting The Rapids of the "Nihon Rhine"
Inuyama Country Club is ａ golf course of 6,743 yards with 18 holes and par of 72. Tt is an internationally acknowledged championhship course. the view from this golf course is magnificent. Ｙou can see the Kiso River sparkling in the sun and cutting through the Nobi Plain. Everyone can enjoy the beautiful woods and rivar in the Inuyama-Hasso Natural Recreation Forest. Camp areas, hiking courses, resting places, and trout nursing ponds are open to visitors. It is a very goog place for outdoor training. Since : 2001.12.26 Copyright 2000-2003 地域ホームページ製作実行委員会 All Rights Reserved.